Wait, do you hear that? That’s right, it’s the sound of summer approaching. In a cinematic sense, this means that film lovers of my particular breed, that is viewers who are not interested in the superhero blockbusters or gross out comedies that flood the box office from now until the beginning of awards season at the end of year, are left with a weird and peculiar selection of pictures to choose from, usually shown in the box sized theatre of your local multiplex. 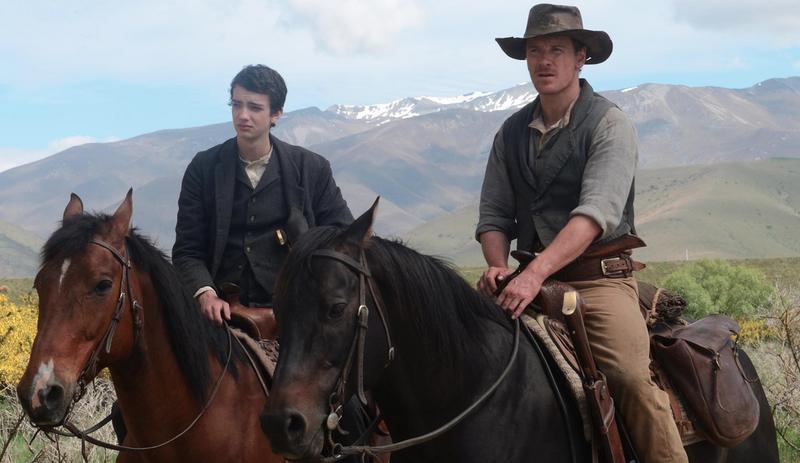 The first of what I am sure will be many under the radar choices this summer comes in the form Slow West, a film of which I knew absolutely nothing before booking my seat. 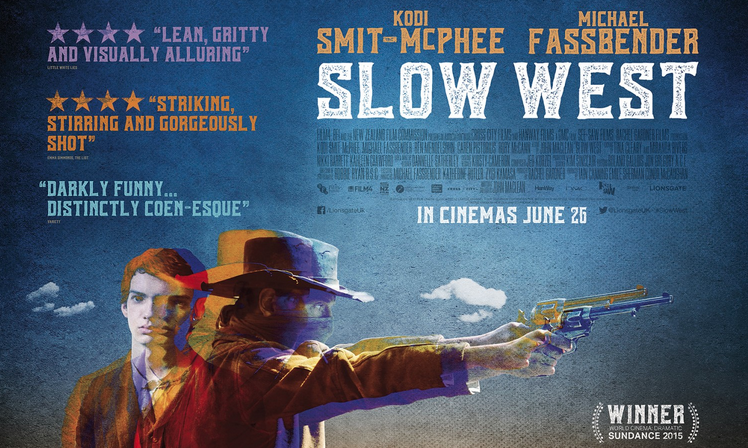 Slow West begins very quickly and operates around a simple narrative, the story of Scottish teenager Jay Cavendish (Kodi Smit-McPhee) and his journey west across the nineteenth century American frontier to be reunited with the girl that he loves. Joining Jay on this dangerous and unpredictable journey is Silas (Michael Fassbender), a mysterious outlaw figure who encounters the young boy on his travels, and with the promise of protected passage through the hostile environment, the two characters forge an uneasy but strong relationship. There is no doubt that the majority of the obstacles the pair are forced to face throughout the narrative are genre cliches to the highest degree, but the quality of performances and genuinely intriguing character arcs that the lead duo present to the audience stop the picture from becoming overly generic. All of the usual suspects are in town from wild Native American savages to bigger, badder outlaws with whom the men have to spar, but my personal soft spot for this kind of film (think True Grit, The Homesman, even more quirky incarnations like Django Unchained) means that the somewhat formulaic nature of many of Slow West’s set pieces did not hamper my enjoyment of the picture overall. What is rather interesting about the film is that, though it displays all of the sweeping scenery and typical plot points of a frontier story, the key themes at play during the picture are those of young love, innocence and youthful vulnerability, all encapsulated in the form of Jay and all uniquely contrasting the volatile, unforgiving atmosphere of the harsh terrain and harsh adversaries that surround him. Over the course of the film, we see young Jay’s experience grow and naivety diminish, and in some way it feels as though the filmmakers are making a statement about the futility of the original American dream, both in the sense that the land is one filled with dread and danger, and the fact that the protagonists ultimate goal, sweetheart Rose (Caren Pistorious), in true Great Gatsby fashion, may not even be worth the massive sacrifices that he is making. Part coming of age, part Western, part buddy movie, Slow West offers a little of everything without ever fully settling down in to a truly comfortable rhythm, though from a personal point of view, the film provides more than enough entertainment to satisfy an eager audience. Though there are a handful of eccentric yet not fully realised characters within the narrative including drunken cowboys, travelling outlaws and vicious bounty hunters, the majority of the meaningful character work is weighted on the shoulders of Kodi Smit-McPhee and Michael Fassbender as Jay and Silas. Smit-McPhee gives a near perfect performance in the lead role, managing to find the balance between a lovesick, determined, innocent youngster and a teenager whose illusions about the ‘new world’ are being quickly shattered as he rapidly becomes a man in a very adult environment. Michael Fassbender as the mysterious Silas proves to be a very effective companion, providing a dose of cynical realism and weather beaten experience that clashes and creates interesting tension with Jay’s hopeless optimism. Something else that Fassbender provides the film with is a real sense of star quality. It’s undeniable that the man is a proper, fully fledged movie star, and that kind of quality really helps in a picture like this where strength of character is of utmost importance. The Western genre has a long, proud tradition of commanding, charismatic male roles, and in the truly traditional ‘strong but silent’ mould, Fassbender provides another for the cinematic history books here. Overall, Slow West is an American frontier picture that, whilst exercising many of the tired and well worn tropes of the genre, provides the audience with something a little different in the form of a less typical lead perspective and an examination of themes such as teen love that feels all encompassing from the inside but seems much more fragile to an outsider. Perfectly paced and timed at eighty four minutes, the film neither outstays its welcome nor leaves the audience with any major outstanding questions. Two engaging lead performances and just enough narrative meat to keep you invested in the tale make Slow West a rewarding, exciting watch with surprising depth. Would recommend! Excellent review Amy; I really look forward to sitting through this one. I am a huge fan of Westerns and was very excited to see Slow West. But, after viewing I felt it left something to be desired. I admit that it has superb acting and great cinematography, but the story lacked depth and I never felt a connection with any of the characters. I wanted to give it a high score, but just couldn’t!